Sometimes I get in breakfast ruts, making the same smoothie or pancakes over and over and over again. These last two weeks it’s been this date-sweetened apple pie oatmeal. Remind me again why ruts are a bad thing? I am so incredibly smitten with dates. Have you tried them? I love how they’ve replaced my need for brown sugar in oatmeal. They’re sticky, sweet, and so satisfying. Cut up into steamy oats and they add the perfect amount of sweetness my sugar-loving palate needs. The apple pie version actually came about by accident. I’d grown quite fond of making a berry compote version but ran out of berries. In my desperation I turned to apples. Honesty, because I was in a hurry the first time I sliced up my apple and microwaved it for convenience (I can almost hear people slinging enzyme-laced insults at me from afar). But you could also saute your apples to keep this process au naturel. In this recipe I baked them. But if you’re short on time make modifications as you see fit (like the microwave). Just don’t tell the enzyme fairies. I love, love, love this bowl. It’s thick, creamy, warm and full of apple-cinnamon flavor. I usually top mine with toasted pecans, which I highly recommend. But in a pinch I used walnuts instead. Just one serving is so satisfying and always keeps me full ’til lunch with plenty of fiber and protein. You could even add a dollop of almond butter or other nut butter for extra protein, if you wish. Sub out other seasonal fruits as well! I love strawberry, mixed berry and blueberry versions as well. 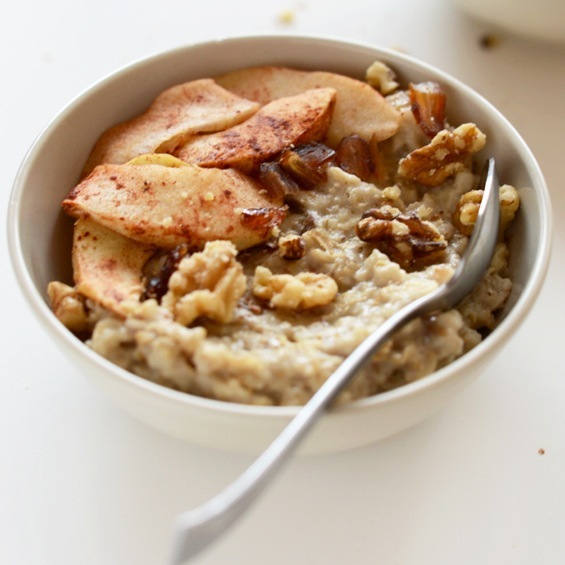 Creamy gluten-free oats sweetened with dates and served over a bed of baked cinnamon apples. The perfect weekday or lazy weekend breakfast. 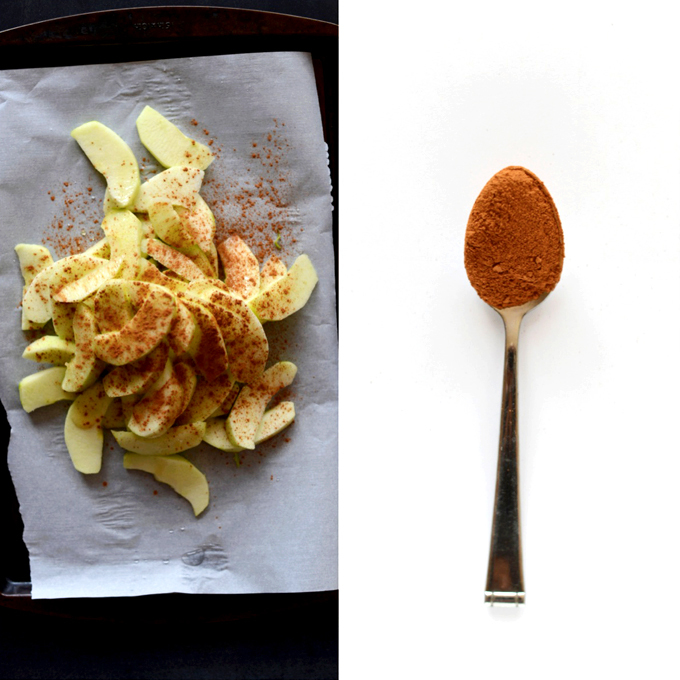 Line a baking sheet with parchment paper and toss apples with lemon juice, cinnamon and honey. Bake for 5 minutes then roll over parchment paper and tuck it in so they're in a "pocket" to trap in moisture. Cook for 10-15 minutes more (20 minutes total) until soft. Set aside. Once thick, remove from stove top. Add a little almond milk if it's too thick for your liking. 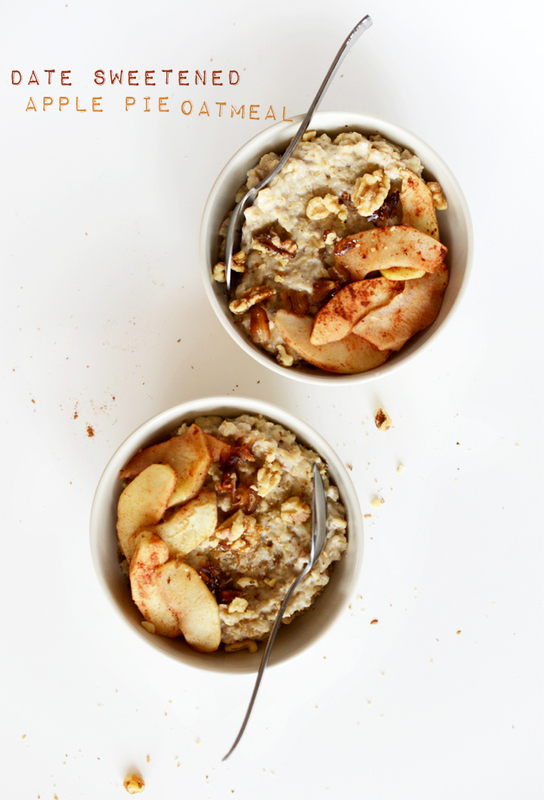 Arrange 1/3 cup baked apples in bottom of a serving bowl and top with oats. Other toppings may include, nuts, nut butter, flaxseed, honey, maple syrup, or cinnamon. I prefer mine with a few toasted pecans and flaxseed. *Nutrition information is a rough estimate calculated without toppings such as nuts or flaxseed. This is so yummy! Thank you so much for the incredible breakfast. When my breakfast is amazing I know that its gonna be a great day! I drizzled Trader Joes’ mixed nut butter on top of my oats and it made it even creamier! This was wonderful. I loved the baked apples (I added chopped pecans to the mix to bake). I soaked, drained, and rinsed the oats overnight, so I didn’t have to cook too long. Also added 1/4 tsp. each fresh grated ginger, cardamom and cinnamon powders after I turned the oats down to simmer. Finally added 2 tsp. each chia seeds and flaxseed meal 5 minutes before serving. Thank you for another wonderful recipe! Made this oatmeal this morning and it was so easy and SOOOOOOOO delicious – it is fall in a bowl and super filling. Very satisfying! I don’t eat oats a lot. I had a craving oddly enough so I made this and it’s lovely. I am loving the cookbook, got it for my bday!! This is a delicious way to make oatmeal, my whole family loves it. I didn’t have honey so I used a little bit of maple syrup instead and I cooked the oats using rice milk due to allergies. Thanks for the great recipe! how long would you microwave the apples? This was sooo yummy! Definitely making more of this. Do you think it would be possible to make the apple component and freeze it? I’d love to freeze the apple component while local apples are in season so I can enjoy this kind of oatmeal during the winter months (I’m trying to shift towards eating more locally-grown foods instead of buying bananas for my oatmeal every week!). Let me know if you think the cooked apples would freeze well. Love your blog, by the way, and your cookbook (which I just bought for myself and a friend earlier this month). Delicious and simple (like all of your recipes). Thank you for all of the flavorful and creative recipes! We just made this for a lazy Sunday, bring on the fall flavors, breakfast. It was FANTASTIC! Topped it with toasted chopped pecans and just the faintest drizzle of maple syrup. A perfect way to welcome in this new season. This looks amazing and I can’t wait to try it. How long do you think this will keep in the fridge? A few days? I have been cooking steel cut oats in my slow cooker with added apples, dried cranberries, raisins, cinnamon and nutmeg. I use 1 c oatmeal/4 c water. Add almond milk when reheated in the microwave. Delicious! Makes enough for 4 servings. Now I will be adding dates for sure! Love them anytime. Do you put a recipe similar to this put together of mine on your site? I made this oatmeal for breakfast this morning and I added 1/4 tsp vanilla, a pinch of cinnamon and a small scoop of almond butter to the oatmeal. It was heavenly! I’m ashamed to admit that I have never sweetened anything with dates before. I think I’ll put them in my oatmeal more often. Jennifer, so glad to hear it! Date-sweetened oats are where it’s at. So natural, guilt free and just a tasty as brown sugar or other alternatives. Made this this morning and I really liked it! I’m picky about oatmeal (it’s a texture thing lol), but I also put way too much sugar in it. The dates were a lovely sweetness and flavor. I only had quick oats, so it was different, but I look forward to having it again with steel cut or something. I thought I was going to need brown sugar (my dedication to it is strong! ), but I loved the dates alone. I also stirred in some maple almond butter and that was divine. Thank you for the recipe! Good! Yes, dates really do sweeten this sufficiently. Glad you liked this, De! 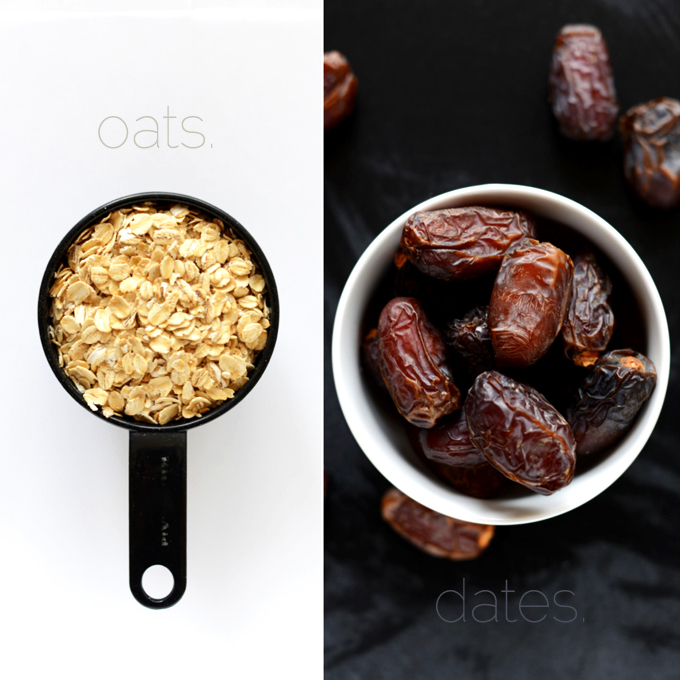 Dates are so delicious, and they sound like the perfect way to add a healthy, sweet note to a morning bowl of oatmeal. Can’t wait to try it! Growing up in an Arab household, we always had dates on hand – shock horror I only started liking them recently! I know Medjool are meant to be the best variety (my parents LOVE them) but I actually prefer the slightly drier varieties (Deglet Noor is my fave) I really need to start using them in ways other than snacking, in saying that, dates and walnuts make a mean snacking combo! 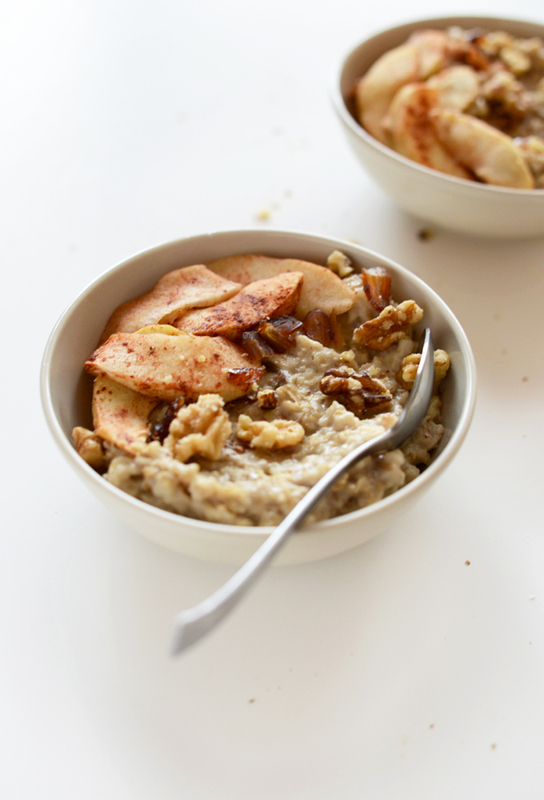 It’s nearing Winter here in Australia so i’m definitely making this apple pie oatmeal! I feel like I’m always in a breakfast rut – it’s either smoothie or oatmeal, but never an oatmeal that looks this delicious. Wow I’ve never thought to use dates as a sweetener substitute, but I love the idea! I will definitely be trying this! This is definitely not a bad rut to get stuck in! I’m loving dates as a sweetener as well lately – they have so much more flavor than regular ole’ sugar. 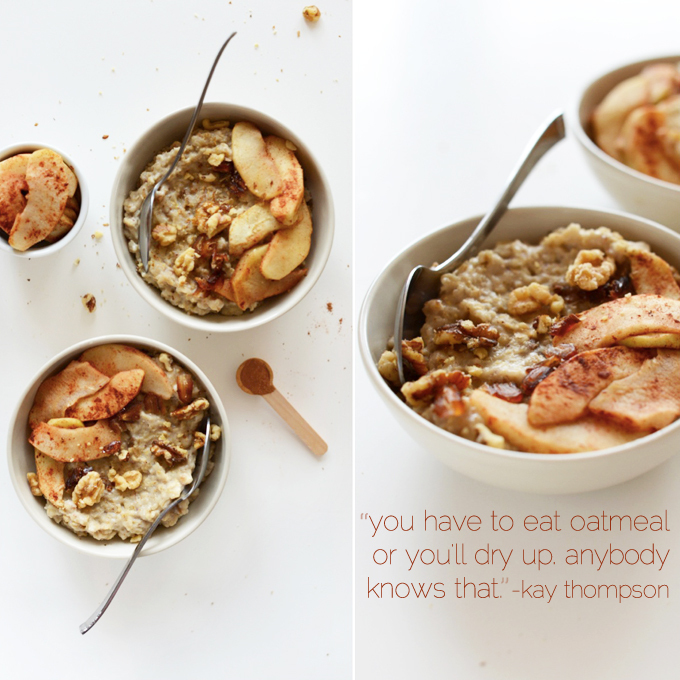 How great is that oatmeal quote by kay thompson?! I kinda wanna put that on my fridge! Oh how funny when I first started reading your post I thought: “ruts”? I prefer “kicks”. We’re on a really boring kick (okay, rut) right now, so we should probably try this! Looks delicious! I will be making this ASAP. I too love oatmeal during weekdays (pancakes and waffles on the weekends ;). P.S. NOTHING is wrong with using a microwave! Toasted pecans on the top is genius. My mouth is watering. This is the most delicious oatmeal I have had in a long time! Tastes kind of like apple crisp, however there is no added butter/oil etc. Absolutely divine. Great job on the recipe, I love how the apples aren’t completely mushy like they sometimes get if you add them directly to the oatmeal. I had oatmeal this morning and dates would have been the perfect addition! Love this! I am so definitely in a breakfast rut right now that I can’t even deal. I think this oatmeal will get me out of it, though — it looks fantastic! I love ho oatmeal for breakfast! Especially this apple pie version! It looks delicious!